How To Be The Best Granny In The World?Wallconsilia.com How To Be The Best Granny In The World? How To Be The Best Granny In The World? The best grannies in the world share a few common qualities. They are friendly and very supportive to their own kids as well as grandkids. If you are a new granny, then you must be feeling overwhelmed with the new responsibilities you have. Whether you are caring for your grandkids or staying away, being a granny means a lot to you. You must make sure that you do your best to make a healthy relationship with your grandkids. Read on for our short but helpful granny guide that shall make you a super-granny in a jiffy. Who are the best grannies BTW? The best grannies in the world are smart, independent and confident women. They may be working a job they love or may be enjoying a happy retirement. Most importantly, the best grannies in the world are happy and this happiness spreads in their families as well. You will notice how they approach their grandchildren and they start smiling immediately. After all, your grandchildren are a bundle of joy for you and this feeling must be shared with the little ones too. Your grandkids’ faces will light up when they see you because you love them with all your heart. Get fit- the first thing that you need to do is to get fit. You will have to play with your grandchildren and even engage in endless baby talks. If you are unwell, you will not be able to do so. Hence, catch up on a morning routine. Even a short walk in your neighborhood would be enough. Just make sure that you get some kind of physical exercise for sure. Eat healthy- the kids these days eat a lot more junk food than you ate till date. While it may sound great to take the kids to a nearby fast food chain every once in a while, it is better to teach them about healthy foods. You will not be able to inculcate this habit in your grandkids if you don’t follow it yourself. So start eating a healthier diet and don’t forget to treat yourself to a savory meal every now and then. Dress up- don’t wear those old boring clothes. You can think about wearing a bright color on a few occasions. These colors are loved by children and they will like being close to you. This trick works really well in case of toddlers. They feel attracted towards brighter colors. Try this tip. We are sure that you will be a popular grandma. Bring back the memories- children love to listen to stories about their grandparents. Leave the fairytales for the bed time. When you are bonding with your grandkids, you need to tell them stories about your childhood. Kids instantly start enjoying these stories. They get inspired and fascinated by your life. If you can teach them some lessons through your own stories, you can bet that they will never forget it throughout their lives. So why don’t you start bringing back a few great memories that could work as great stories for the kids? Be happy- learn to shrug a few events and memories off your shoulder. You are in your 50s now and this is high time that you learn to be happy and content in yourself. Don’t worry about the world. Not all situations are under your control. So make sure that you learn the art of dealing with the world with a smile and have fun with the kids. Is it not great to be a granny? Your life will change for good when a new member arrives in your family. If you follow the tips that we have given above, we are sure that children will like you for sure. However, what do you do when you are with the kids alone or when you have to care for them? Visiting your adult kids for a while may not be a very daunting activity. All you have to do is shower them with love and a few gifts, have a short fun chat and go back home. However, if you get to spend more time with the kids or have to care for them, the situation can get really tricky. 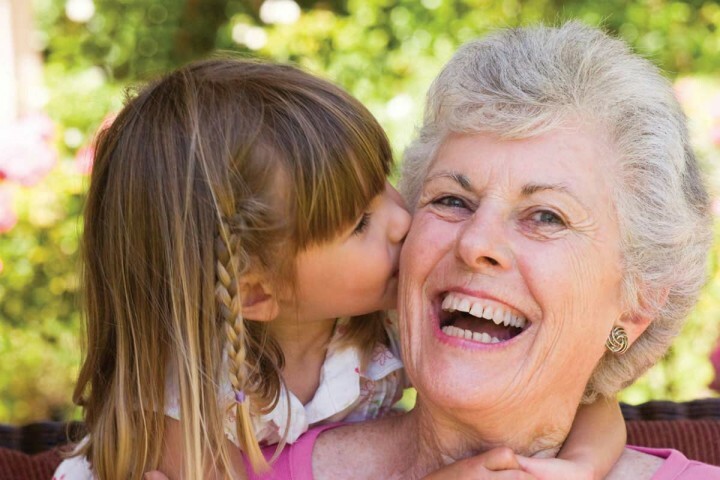 Here are a few ways in which staying with the grandchildren will become a bliss for you. Make some piping hot chocolate drink for the kids. Tuck them in their beds or sit near the fireplace. Now amaze them with some of the best stories that you know. Start by telling them about your life and times. Don’t make it sound boring and don’t tell them how your times were better than the present. Focus on those interesting little pieces of your history and share it with the kids. They would love them. Who knows, they might be inspired to create such interesting stories to share with their own kids. It would be a family tradition that passes on for generations. If the kids are pre-teens, then you will definitely enjoy this activity with them. If you have a special family recipe that the kids will love, cook it with them. Let them help you in passing the milk bottle or condiments. They will keep asking questions about the recipe and this would make them more interested in this work. Finally, when they enjoy their meal with you, they would feel extremely happy. So make sure that you get the best family recipes along. If you don’t have any such recipes, then you can search online for the best kid-friendly recipes. You can even try a newer version of their favorite snack or may even introduce them to a new flavor of ice cream. If your adult kids are available, involve them in this process as well. Children are fond of novelty and when you try new things with them, they will bond with you in a better way. Don’t worry about the results. Just keep up the spirit of experimenting and finding new flavors. Your grandkids will learn many life lessons. They will learn that failure does not determine your destiny and trying again and again is the only way to get the best results. Are you not the granny who can cook or tell stories? Don’t worry. You can still have fun with the kids. Why don’t you go out and play with them? The best way in which you can bond with the kids is by making sure that they play with you. Use some of your crafts skills in order to introduce them to a brand new style of playing games. Why don’t you play role-play games? Create a small sand castle near the pool and let one child be the princess who has been kidnapped by the evil dragon. Let one kid be the knight in the shining armor. You can become the evil dragon. Fight with cardboard swords and let each of them have their own special dress too. It would be an amazing game to play. It is all about being creative with the kids. There can be some games that you used to play when you are young. Why don’t you introduce the kids to those games? Ask anyone about their experiences with their granny and they will tell you about chocolate chip cookies and some unexpected gifts all through the year. Grannies are very special and they all feel really connected with their grandchildren. However, you might sometimes face a few problems in your relationship with the grandkids. How will you overcome such an issue? Let us take a look at a few problems that grannies commonly face and how to overcome them. Yes, there is a time when your adult kids think that you are caring too much for the grandkids, even to the limits of spoiling them. There are many grannies who buy tons of sugary candies for the grandkids or give them expensive gifts. This might not sound too good to your adult kids. Hence, it is better that you talk to your own children. They may have different styles of parenting and you have to ensure that their kids are raised in the way that they like. Talk to the mother of the kids and ask if she has any specific considerations for her kids. Things will be smoother this way. If your grandkids are teenagers, then they themselves may find you as over daunting. You might wish to continue with your relationship with them like before. However, to them, life has changed drastically and may not always be available for playing in the sand and sun. You have to understand these changing needs and ensure that you do not smother your grandkids. They deserve some space. The ideal role that you can play at this moment is to act like a best friend and a guide to them. Not all teenagers share their problems with their parents. However, they may feel comfortable while sharing those problems with you. So make sure that you lend them a patient ear and listen to their troubles. You can be a support system to your teenage grandkids. This is probably the most difficult thing about being a granny. Whether it is Christmas or the birthday or your grandkids, you have to buy gifts for them. Now, looking for the right gift can be the trickiest thing in the world. Sometimes, you may have to buy gifts for other kids when you are attending the birthday party of one kid. In such a case, you will become a confused granny and end up messing things up. However, don’t feel apprehensive. Just ensure that you find things that are colorful, creative and unique. Children and their grandparents often have similar likes and dislikes, especially if they have spent a lot of time with each other. If you know what the child wants for his birthday, better find the same thing. The kids get really happy when they get what they want. The problems with generation gap are seen more between parents and their kids. The children usually bond better with their grandparents. However, this can only be done when you open the channels of conversation with the kids. The times have changed drastically since you were young and facing the same issues. However, experience has taught you how to handle situations more maturely. Pass on the wisdom and make sure that you always maintain friendly relations with them. Being in the best granny in the world takes a lot of time and effort. Though bonding with kids and taking care of them are not new experiences for you, you have to be extra careful with the grandkids. However, we advise you not to feel too stressed out. After all, you want to have fun with the grandkids. They should enjoy spending their time with you and must look forward to your next visit. As a new age grandma, you can also make use of technology in order to stay connected with your kids. Use Skype, WhatsApp and even emails to stay in contact with the kids. Just focus on being smart and playful. The more creativity you bring in your interactions with the kids, the better response you will get from them. Remember, kids these days are very vulnerable. Hence, it is high time that you become the Super Granny superhero and save the day for the kids. Maintain a generally nice attitude towards the kids and even their friends. The more you do this, the more points you score. In the end, we urge all the Super Grannies around to get ready with their red flowy capes and bundle of knowledge coupled with friendly energies to help you grandchildren get the best childhood in the world.